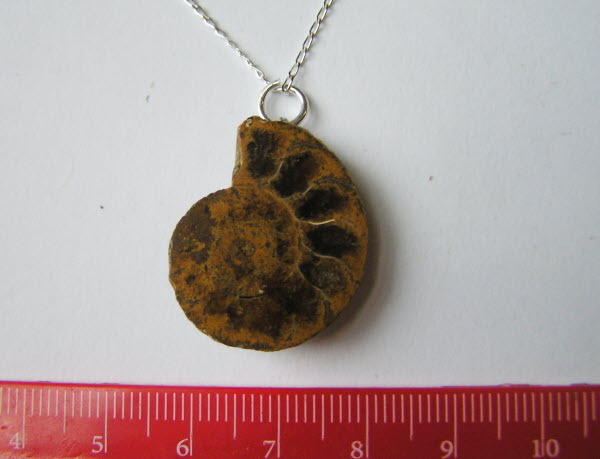 Madagascan Fossil Ammonite Slice Necklace - UNIQUE! << Back Madagascan Fossil Ammonite Slice Necklace - UNIQUE! This is a truly exquisite fossil Ammonite pendant hand crafted from a Cretaceous Madagascan Ammonite slice strung from an 18 inch solid sterling silver curb chain. The Ammonite slice measures 2.5cm from top to Bottom. Strung on an 18 Inch Sterling silver curb chain.